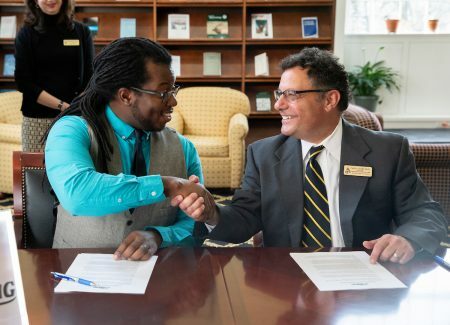 Nick George, founder and executive director of The Listening, and Carl Girelli, vice president for academic affairs and dean of Randolph College, shake hands following the announcement of the new partnership. On Tuesday, Randolph formally announced a new partnership with The Listening to open a Freedom School. The program is the first of its kind in Lynchburg, and only the second Freedom School in the state of Virginia. An initiative of the Children’s Defense Fund, Freedom Schools offer a free, six-week summer literacy and cultural enrichment program for K-12 students in communities where quality academic enrichment programming is limited, too expensive, or non-existent. Sessions are led by highly qualified, college-aged servant leader interns from a variety of academic disciplines. In addition to educational activities, students in the program receive two nutritious meals a day as well as a new book each week to build their home libraries. Enrollment for the Freedom School at Randolph is set to open in spring 2019.